Streamline dispatching, reduce response times, and minimize costs with the Acumatica Field Service Edition suite that works with CRM, sales, inventory, purchasing, accounting, and financial reporting. With a 360-degree view of customer activities, improve the overall customer experience and elevate customer satisfaction to earn higher recurring revenues and gain a competitive advantage. All the applications are web-based and fully mobile which is ideal for your field workforce. 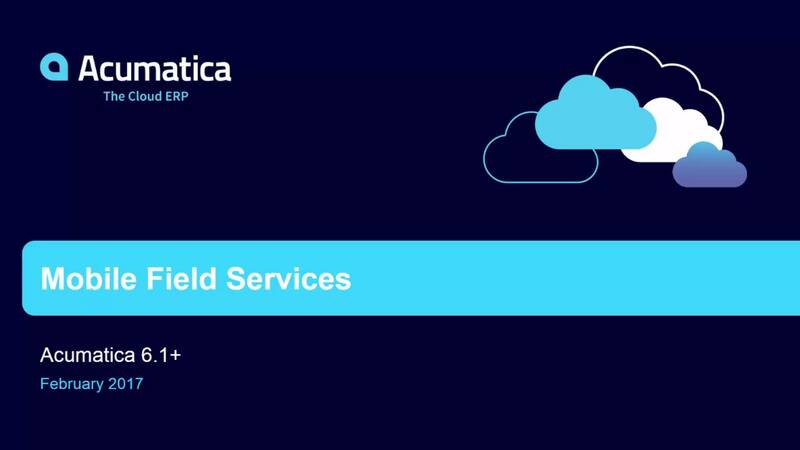 Unlike other field services applications the user interface provides a seamless transition between applications because the Acumatica Field Services Management is part of Acumatica ERP, not a bolt on application. Scheduling the right people at the right time with the right skills to perform work efficiently is handled quickly with Acumatica Field Service Management. Quickly capture service needs and access customer information, product history, and resources required to shorten time between call receipt and job assignment. Create daily or weekly schedules automatically or using drag-and drop tools on the graphical dispatch board utilizing colors to identify the status of each service order. Provides a powerful tool for optimizing routes for appointments with ability to filter appointments by several different criteria. Routes are plotted In Google Maps for each service person with lists of required resources (equipment or machine). 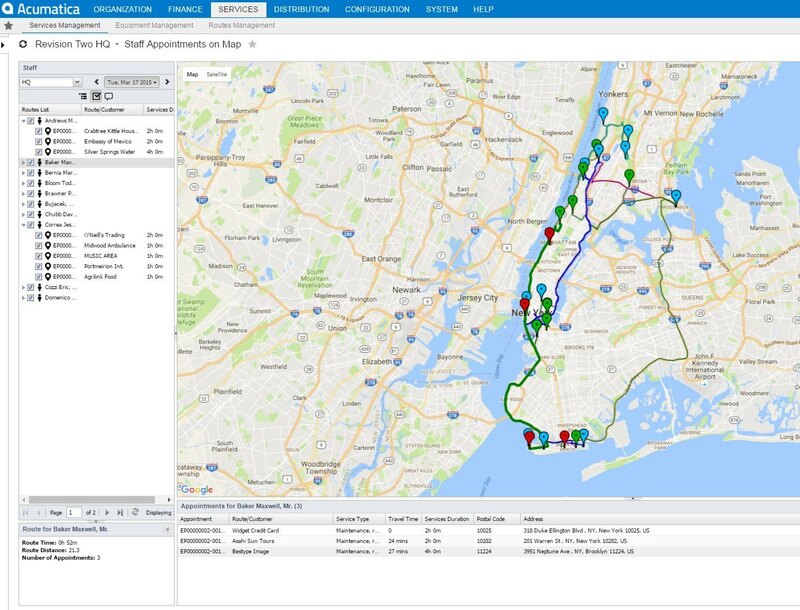 Graphically displaying the routes visually informs the dispatcher of order status with different colors enabling them to rapidly respond and make route changes. Automatically uses Google map services to optimize the route to minimize the driving time. Since the route is displayed on the technician’s mobile device, the route will change as traffic conditions change. Utilizes the most popular map provider with an interface familiar to everyone. Real-time graphical information about location, drive time, etc., is available anywhere. Changes to the route are instantly redrawn and available on the technician’s mobile device. Keep your staff members connected through any device with a browser or with the native mobile Android and Apple iOS (iPad) app. They will be able to access service information and customer data from anywhere at any time. Being a full web ERP, Acumatica can run on the entire spectrum of mobile devices. This is important for the companies that want laptops instead of small devices, like a phone. Use the visual tools to add unplanned service calls. Find out how changes to planned routes will affect the team with the least amount of impact to the planned schedule. Have the new service order sent to the technician’s mobile device. Records the complete history of the equipment or machine installed at each customer’s site and tracks repair parts in stock. With Acumatica’s integration of sales and service stores the equipment records through quoting, order, delivery, installation, and then service work in the field. It also includes manufacturer, model, configuration, and schedule preventive maintenance orders. Customer equipment can be associated to recurring schedules and contracts in Acumatica Customer Management (sold as an optional application). In field services, tools and repair parts are typically spread across multiple vehicles and warehouse locations. With Acumatica, you can get control and keep track of the locations and costs. Since inventory and purchasing are integrated, shortages can trigger replenishment orders. Inventory can be sent to a specific location and when the parts arrive, the dispatcher is alerted to schedule the service appointment for installation. Recurring service contracts are a significant source of revenue. Visibility on renewal dates for each contract helps preserve the revenue. Dashboards can alert the service team of expiring contracts. 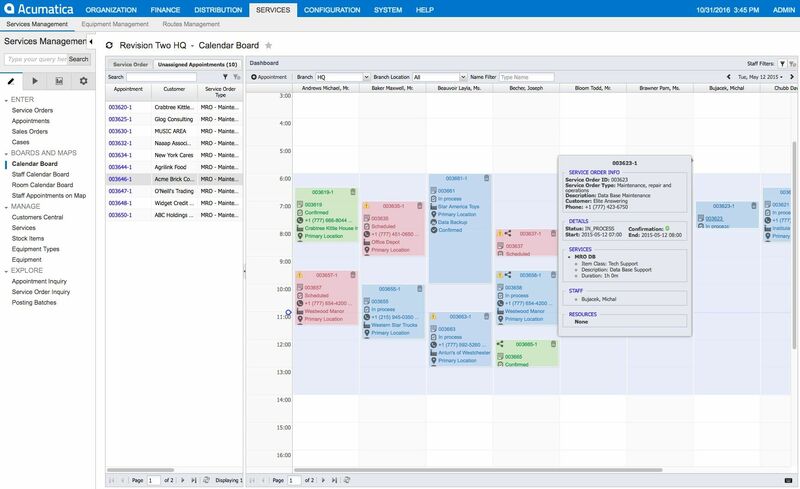 Your team can create and manage multiple service schedules per customer and fine-tune appointments using the Schedule Calendar Board for staff and resources. Normally, Warranty Management is a time consuming, but required, activity. With Acumatica, this task is integrated with the other applications. Establish warranty offers for your customers, specifying which parts are under warranty to avoid confusion, mischarges, and objections. Multidimensional contracts (different warranty periods for different components of the system) help to track warranties from sales to repair in the field, specifying what is covered and what is not. This helps to ensure billing accuracy, improving customer satisfaction. All users of the system can stay up to date with the information that matters to them using Acumatica BI (business intelligence). Personalized dashboards are easily created and turn raw data into rich visuals to track progress and spot trends as they happen. Acumatica’s business intelligence can also leverage Microsoft Power BI to deliver insights from multiple data sources that are key to your business. Customer Management (CRM) is part of Acumatica, not a loosely integrated module. From marketing, quoting, building, and installing, and then in field services, the customer information is visible throughout the organization providing a 360-degree field of all customer interactions. When selling equipment, the installation appointment can be scheduled while the user is in order entry. (Customer Management is sold as an optional application). Field Service Management is not just for small projects. When the installations are very large (tasks, people, or equipment) all the costs (time, materials, and expense) to the phases of the project are tracked in Acumatica Project Accounting (sold as an optional application). Compare actual project costs with original and revised budgets in real time. The visual Dispatch Calendar Board gets the right people to the right service or job every time. Tracks all products related to your customer and schedules preventative maintenance. Sold as a separate application. Augment Acumatica’s base financials with advanced financial capabilities, including GL consolidation, sub-accounts, and automatic revenue recognition. How do you choose a field service management system that supports outstanding customer service? What our customers are saying about Acumatica's Service Management? Acumatica was by far the most robust Cloud ERP offering. It offers more functionality, better prices and more value to users. I am still getting used to drinking a coffee in Starbucks while looking at our ERP, but that is the flexibility and usability that all companies should have now. Acumatica is the backbone of our cloud environment. It has already changed the way we do things, improving efficiency. It will clearly strengthen our company in the long run. 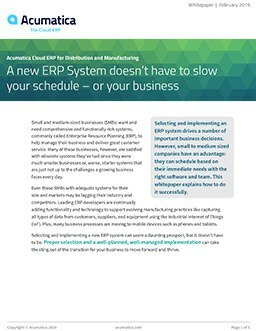 The leadership team of any small or medium business considering an ERP system is doing themselves a great disservice if Acumatica isn’t on their list to investigate. Acumatica has already proved effective in handling future needs with a clean and simple integration to our e-commerce system… I would recommend Acumatica to any growing distributor looking for a great system. I am constantly amazed with how Acumatica seems to just "work." Anything we seem to imagine the system could do, we've been able to make happen without the assistance of external modifications. What are the true costs and benefits of your next ERP solution? Crunch the numbers and print your results.